G.P. Putnam's Sons Books for Young Readers, 9780399251566, 32pp. 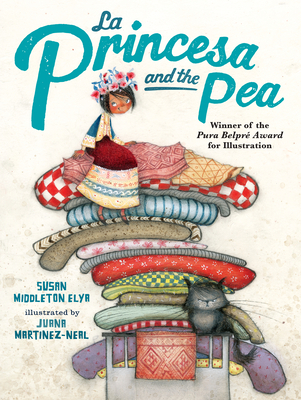 The Princess and the Pea gets a fresh twist in this charming bilingual retelling, winner of the Pura Belpré Medal for Illustration. The queen has a secret test in mind to see if this girl is really a princesa, but the prince might just have a sneaky plan, too . . .
Susan Middleton Elya is the author of many books that cleverly incorporate Spanish vocabulary into lively verse, including La Madre Goose: Nursery Rhymes for Los Niños, illustrated by Juana Martinez-Neal, Little Roja Riding Hood, illustrated by Susan Guevara, and Oh No, Gotta Go!, illustrated by G. Brian Karas. Her writing has been described as “Perfect for bilingual classes stretching their English wings and a charming way to introduce Spanish to English speakers” (Kirkus Reviews, starred review). Juana Martinez-Neal grew up and studied painting in Lima, Peru, and now lives with her family in Scottsdale, Arizona. Her illustrations for this book were inspired by the culture and arts of the indigenous people of Huilloc and Colca Canyon, Peru.